Contact Mark at Skylarks Barn on 01787 211 115 or complete the enquiry form. Enjoy a tranquil country holiday at this idyllic rural retreat with its beautiful large garden and location next to farmlands and meadowlands. With a modern stylish and spacious interior, this is a welcoming high quality barn conversion which sleeps up to 4 people in 2 bedrooms. Pet-friendly, up to 2 small dogs are welcome at this lovely rural retreat. 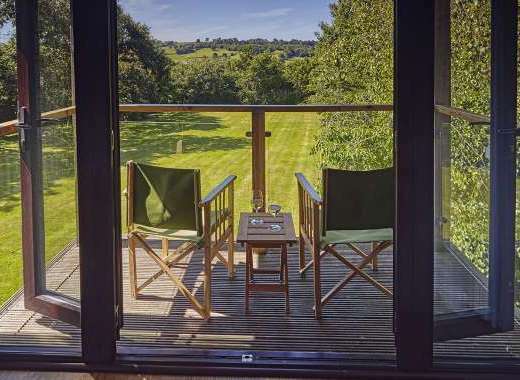 Designed with care and attention to detail, this holiday barn is a great place to relax and features a lounge with warming woodburning stove and dining area with glass doors that open out to the lush gardens, as well as a stylish modern kitchen. Also on the ground floor is a romantic double bedroom with en-suite shower room and upstairs is the second double bedroom with its own bathroom with a roll top bath. The generous gardens set next to rolling countryside and the rural location of this barn conversion help to make Skylarks a truly appealing rural holiday home, yet the town of Stowmarket is less than 10 minutes' drive away and Bury St Edmunds is just half an hour's drive away. Beautiful unspoilt Medieval Villages, Dedham Vale Area of Outstanding Natural Beauty, Woodland and Countryside walks, Remote rural idyll. Recommended Places to Visit: Ipswich, the Dedham Vale Area of Outstanding Natural Beauty and Constable Country.